AstLinux now supports the WireGuard VPN. WireGuard is an extremely simple yet fast and modern VPN that utilizes state-of-the-art cryptography. WireGuard was created by Jason A. Donenfeld. Info → Currently (November 2018) WireGuard has not quite yet been accepted into the mainline Linux kernel. Be certain to perform your own due diligence and testing of what could become the premier VPN in the not too distant future. Fill in the “IPv4 Address”, click “Save Settings” and then “Restart VPN”. WireGuard VPN is now running, but by default no mobile clients or remote peers are defined. Next, you can define a “Mobile Client” or “Remote Peer” or both. A “Mobile Client” is a single IP endpoint peer, like an Android or iOS mobile device, very easy to manage. A “Remote Peer” can be a full network peer, possibly another AstLinux box, more powerful but somewhat more complex to manage. Note → Mobile Clients are automatically assigned a unique IP address in the range of .101 to .199 for the last octet (example here: 10.4.0.101 to 10.4.0.199). Best practice is to refrain from using IP's in this range for both this tunnel's “IPv4 Address” (above) and Remote Peer's IP address so both configuration types can coexist. Similarly for IPv6 the Mobile Client reserved range is …:0101 to …:0199. Note: AstLinux 1.3.5 or later supports mobile client configuration. Server Hostname: The publicly reachable DNS name that the remote client will connect to. A static IPv4 or IPv6 address may be used, but an IPv6 address must be enclosed with square brackets (IPv6 example: [2001:0db8::1]). Client Routing: Specify how newly created clients should route traffic. Tip → The defaults only apply to newly created clients. The client's configuration can be changed later via “Edit Peer”. Clients can be just as easily removed by checking the box under “Delete” and clicking “Delete Checked”. Important → As Mobile Clients are created and deleted, the WireGuard VPN is updated in realtime, so a “Restart VPN” is NOT required when managing mobile clients. This is a very useful feature allowing mobile clients to be managed without disrupting other active WireGuard VPN users. The [Peer] section defines the AstLinux WireGuard configuration, and should not ever be edited. The [Remote_Peer] section defines what is exported as client credentials [Peer] section, you may edit the AllowedIPs entry if needed. The [Remote_Config] section defines what is exported as client credentials included in the [Interface] section, you may edit the DNS entry if needed. The final step for each Mobile Client is to download the client's credentials by clicking on “Download”, a .zip file will be downloaded. Important → The downloaded credentials .zip file must be handled securely as it's contents are not encrypted. View the enclosed README.txt file for more info. iPad-fred.conf - The Mobile Client's WireGuard configuration in plain text. iPad-fred.png - A PNG graphics file containing a QR code of the iPad-fred.conf text. Scanning the QR code with your mobile device is a secure method to import the credentials. README.txt - A text file describing the files. Note → While the QR code PNG file looks obfuscated to the human eye, keep it secure. Using the WireGuard App on your mobile device, import the credentials… scan the QR code or securely import the .conf file. Your VPN tunnel should work immediately, initiated by the mobile client. Note → Defining remote peers is optional when Mobile Clients are defined. By default no remote peers are defined. Click on Edit Peer Config and view the commented example peer. Uncomment [Peer] and uncomment and define the the PublicKey and AllowedIPs entries. Tip → PublicKey is the public key of the remote peer. Tip → AllowedIPs are a comma-separated list of IPv4 and/or IPv6 address/networks that are allowed into the VPN tunnel, destined to the remote peer. The Endpoint entry is optional, define it if the peer has a known IP Address or DNS name. If the peer is a roaming road-warrior, leave Endpoint commented-out. The PersistentKeepalive entry is optional, a non-zero value in seconds will send keep-alive packets to the remote peer (rarely needed). Note that when multiple peers are defined, the corresponding AllowedIPs operate as a sort of routing table, uniquely directing routed packets to only one peer or no peers (dropped). IPv4 Address: Define an IPv4 address which configures the WireGuard tunnel device wg0 network. Required. IPv6/nn Address: Define if you have an IPv4/IPv6 system and want to create a IPv6 WireGuard tunnel device wg0 network. IPv4/IPv6 Routes: Usually leave this empty and check “Automatic Routes:”. Manually defining routes may be useful in special situations. Automatic Routes: When checked, automatically create routes using the AllowedIPs entries for all the peers. This setting is ignored if “IPv4/IPv6 Routes” is defined. Note → If an AllowedIPs entry specifies a /0 default route, no automatic route will be created for that entry. Interface Device: Set the tunnel interface device, currently only wg0 is shown. Interface MTU: Usually leave this as “default” and let WireGuard determine the best MTU. Setting this to less than 1420 may be useful in special situations. UDP Listen Port: Set the UDP port number the service listens on, defaults to 51820. External Hosts: Define a space separated list of allowed IPv4/IPv6 addresses via the external interface. 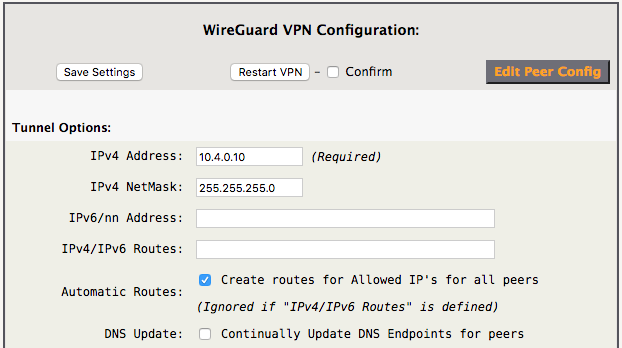 The external firewall rules are automatically created by the wireguard-vpn plugin . The firewall must be enabled, see the “Enable Firewall” section below for more info. Redirect Ports: Choose pre-defined UDP ports on the external interface to redirect to the “UDP Listen Port”. This is useful when a remote client using public WiFi with restrictive outbound port filtering can use alternate outbound ports to the standard WireGuard VPN endpoint. Peer Isolation: Choose to “Pass” or “Deny” Peer→Peer traffic. “Deny” isolates connected peers, blocking access with each other. When WireGuard VPN is active, a “This Peer's Public Key:” entry is shown, for easy copy/paste to remote peer configurations . Additionally, the WireGuard VPN tunnel is NAT'ed via the external interface, such that if an exiting IPv4 tunnel packet is routed out through the external interface it will have a NAT'ed path back into the tunnel. Optionally, if there exists an executable /mnt/kd/wireguard.script script file it will be called after the VPN is up and before the VPN is down. logger -t wireguard -p kern.info "WireGuard VPN is started on '$INTERFACE' interface." logger -t wireguard -p kern.info "WireGuard VPN is stopping '$INTERFACE' interface." and add ip rule add … fwmark 51820 rules on POST_UP and remove the same rules on PRE_DOWN. WireGuard is now available for Android and as Beta-Version for Apple iOS (via TestFlight app only ≥12.x).